Diesel mechanics currently occupy a very important place in the industrial sector. From the small diesel engines used for portable generators to gigantic diesel power plants driving ocean-going freighters, diesel engines are a central part of the world’s transport and industrial infrastructure. For this reason, a career as a diesel mechanic is an extremely attractive option for individuals seeking a well-compensated and dependable source of employment. Diesel engines have been in commercial use for over a century and in fact are the dominant source of power for commercial trucks, trains, ships and stationary power sources. Because of this, diesel mechanics have long been a vital part of the economy and their importance continues to grow as the popularity of diesel engines increases. In fact, diesel engines are superior to gasoline engines in many ways, including superior fuel economy, a reduced level of pollution and the ability to make use of a wide range of fuels without extensive and expensive modifications to the engine. These factors, combined with the growing need to improve America’s fuel economy and environmental footprint, have seen an explosion in the use of diesel engines in private vehicles, in addition to their continued popularity in other applications. There are a wide range of available diesel mechanic jobs, ranging from local neighborhood mechanics to engineers working with large cargo ships and trains. Although many of these jobs require distinct skill sets, they all involve maintaining, repairing and monitoring diesel engine systems. The most common type of diesel engine repair services found in the United States involves repairing automotive diesel engines. In many cases, this involves the repair of large commercial engines, but a growing number of neighborhood garages are hiring diesel mechanics in order to be able to offer repair services for private cars, SUVs and trucks that use diesel engines. In addition, commercial trucks, emergency vehicles and construction vehicles also use diesel engines. In this case, diesel mechanics often work at municipal or state repair centers for publicly owned vehicles or at commercial truck repair garages for private commercial vehicles. A common area of employment is working at garages stationed at truck stops, which are often open 24-hours a day and on weekends, which requires a larger staff and more overtime than those garages that have more limited business hours. Finally, some diesel mechanics work out of a vehicle, bringing repair services to their clients, rather than requiring that the client bring the disabled vehicle to a garage. This is especially common for services that work with commercial trucks, which can be difficult to transport to a garage. While many diesel mechanics are employed by other individuals, a number of mechanics are self-employed. While this generally requires a greater investment of time and effort, the self-employed mechanic has far more freedom than his or her counterparts who are employed by a company. In many cases, self-employed diesel mechanics develop a stable and loyal group of clients who hire them to exclusively work on their vehicles. Most modern trains are powered by diesel-electric engines, where a diesel motor drives a generator, which in turn powers the train’s motors. Trains are operated on a near continual basis, which requires that their engines be kept in good running order at all times. Most diesel mechanics working in this field are employed by the railroad company to ensure that their trains will remain in good running condition. When a train malfunctions, the mechanic may either work on it in the field or wait until it has been returned to a central depot for repair. Diesel mechanics that work on trains must also have some knowledge of the train’s ancillary systems, such as the generator and electric motors that drive the train. In addition, they may be required to work on a tight schedule in addition to being required to accept extensive overtime. Finally, diesel mechanics who are traveling with the train or who must travel to the location of a disabled train will likely be forced to spend a large amount of time away from their families, which may be an issue for some mechanics. Marine diesel engines range in size from small outboard motors to building sized power plants for large container ships and supertankers. These diesel engines must often operate for days or weeks at a time, making it vital that they be kept in excellent operating condition at all times. In addition, because size is not a factor, many marine diesel engines are low-speed designs that have a high degree of thermal efficiency. In addition, these engines can operate on lower quality fuel, further reducing the cost of their operation. The marine diesel mechanic must be able to work with very large engines, and in addition must be prepared to handle and counteract the effects of operating in a marine environment. A major duty is ensuring that corrosive seawater does not damage the engine or its secondary components. Like train engines, many marine diesel engines, especially in larger vessels, power an electrical generator rather than directly driving the ships marine propellers. While marine diesel mechanics are well paid, they often must have a wider range of skills than traditional diesel mechanics. The must know the basic skills of a sailor, be able to work on a wide variety of diesel engines and ship systems and must also understand and abide by the various marine safety laws, both domestic and foreign. In addition, marine diesel mechanics are also often in charge of operating the engine at the direction of the captain or other supervising officer. Finally, this field may require the marine diesel mechanic to accept long periods of separation from his or her family, often several months at a time. Furthermore, because they are restricted to the ship while it is traveling, any shipping delays may result in an extended absence from their home. 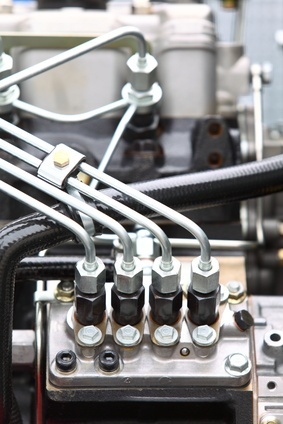 Fixed diesel engines are commonly used to power electrical generators, pumps and hydraulic systems. In many cases, they are used as emergency backup systems for critical services, such as a hospitals power grid. In other cases, the diesel engine may be used at a site that is unconnected to any larger power grid. Fixed diesel engine mechanics must be prepared to work on a wide range of diesel engine types and designs and must also be prepared to travel to the site of the engine for maintenance or repair. Because most fixed diesel engines power other systems, the mechanic may be required to obtain proficiency in those systems before he or she will be hired. Finally, some sites have a mechanic as part of the permanent staff in order to ensure that their diesel engines are always in operating condition. In this case, the diesel mechanic will focus on a single site’s engines; testing and maintaining them to ensure that they will be able take over when needed. This is especially common for sites where uninterrupted power is a critical consideration, such as at data storage and backup centers. Small diesel engines are commonly used in gardening and household equipment, ranging from chainsaws to portable generators. Many diesel mechanics work on these systems, usually at a repair shop where damaged engines are brought to them for repair. This job does not involve travel and often serves a single local community. While overtime is sometimes required to keep up with demand, a diesel mechanic in this field will experience the same type of work environment as a local automotive diesel mechanic working at a garage. In some cases, automotive diesel mechanics may also work on small diesel engines, especially if they are employed in a small neighborhood garage. There are a wide range of educational options for diesel mechanics, ranging from informal training to completing a formal course of education at a community college. The most common methods of obtaining training as a diesel mechanic include completing a diesel mechanic training course, becoming an apprentice, and informal training at a local garage. National Aviation Academy is a nationally recognized Aviation Maintenance training school, headquartered in Clearwater, Florida. Our programs prepare students for certification by the Federal Aviation Administration. The FAA Airframe and Powerplant (A & P) Certification is required to perform maintenance and repairs on aircraft from small Cessna Props, to the largest jet airplanes. In simple terms, we are an airplane mechanic school, although we typically stick with the aviation mechanic school or aviation maintenance technician school terminology. Vocational schools, adult education centers and community colleges all offer diesel mechanic training programs. These programs usually take anywhere from several months to two years or more, depending on the students schedule, the nature of the program and whether the student is attending school on a full-time or part-time basis. The theory of diesel engine operation. Repair techniques for diesel engines. Electronic control systems and diesel engines. The use of modern diagnostic equipment. Compliance with modern engine emission guidelines. In general, a student should seek out a program that has been accredited by the National Automotive Technicians Education Foundation (NATEF). The NATEF ensures that all accredited programs have a well-trained educational staff in addition to up to date equipment and training methodologies. Furthermore, completing an accredited program can improve the diesel mechanics chances of quickly finding employment upon graduation. Although less common then it was in the past, informal training remains a viable route for individuals who cannot obtain training in a formal program. In most cases, informal training involves being hired by a garage or repair center, where the individual will be trained as a diesel mechanic while carrying out those tasks that he or she is suited for. As the employee improves his or her skills, more responsibilities will be added until the employee is considered a qualified diesel mechanic. The main advantage of informal or on the job training is that the individual is considered an employee and receives a wage during his or her training. This is especially important for those who cannot afford the cost of a formal training program. In addition, the worker will usually continue to be employed at the garage after he or she becomes fully trained, which can be important for individuals seeking to remain near their homes. However, future employers may be less willing to hire someone who has received informal training. In addition, this method of training usually takes considerably longer than a formal course of training and there is no way to ensure that the education received is a high-quality one. While an apprenticeship appears similar to on the job training at first glance, it usually provides a more structured learning environment. In many cases, especially when working with a large company, apprentices combine on the job training with a formal course of education and grading. However, apprenticeships are difficult to obtain in today’s economy, and many companies require that any prospective apprentices already have some degree of formal education in the field of diesel repair. In many cases, especially when working with a large company, apprentices combine on the job training with a formal course of education and grading. However, apprenticeships are difficult to obtain in today’s economy, and many companies require that any prospective apprentices already have some degree of formal education in the field of diesel repair. The employment prospects for diesel mechanics of all types continue to improve. The Bureau of Labor Statistics (BLS) has noted that the number of employed diesel mechanics in 2010 exceeded 242,000 jobs and that number is expected to increase to over 277,000 jobs by 2020. When combined with other fields needing diesel mechanics, such as marine transportation and commercial railroads, the job outlook for trained diesel mechanics is a very bright one indeed. When combined with other fields needing diesel mechanics, such as marine transportation and commercial railroads, the job outlook for trained diesel mechanics is a very bright one indeed. Furthermore, diesel mechanics receive a very competitive wage. The BLS has noted that the median annual wage for diesel mechanics is over $40,000. Related occupations, such as ship engineers earn over $68,000, although this field requires a considerable amount of experience and ancillary education. However, when combined with the job security found as a diesel mechanic, the wage they receive makes this an extremely attractive career decision. Whether an individual is interested in becoming a local diesel mechanic, or working at a large garage, the field of diesel repair and maintenance has a wide range of opportunities. Diesel mechanics can enjoy a well-compensated and secure career that allows them to work in a growing number of specific fields. With a wide range of educational and training opportunities available for individuals interested in this field, diesel engineering is currently a very attractive choice for new workers and those seeking to transfer to a more rewarding career alike.